A. I worked at JCUA from 1998-2000 and I was the Director of the Associate Division. Note: This presentation was made at the JCUA Member Hanukkah party last week. Stacey Flint and her daughter, Lauren, at the JCUA member Hanukkah party. More than 15 years ago, I was a JCUA staff person. Today, I am member of JCUA. I’d like to share my journey with JCUA and explain why you should join with me as a member of JCUA. JCUA introduced me to the city of Chicago and helped me to understand justice in America. My knowledge of justice was the Civil Rights movement, and I was as a spectator of a historic past. JCUA opened my understanding of the heart of the movement and allowed me to go from spectator to an actor for change. Jews and social justice issues are linked most often with the Civil Rights movement in partnership with Black Americans. Injustices in the political and social justice sphere culminated in Jewish and Black collaborations. Both communities were victims of a long history of institutionalized discrimination and social shunning by mostly white, Christian populations. Jim Crow signage often proclaimed, “No Jews, no Dogs, no Negroes.” At the height of the Civil Rights era, Jews and Blacks marched together in Selma (Dr. King, Rabbi Abraham Joshua Heschel, and Rabbi Robert J. Marx), and challenged housing discrimination in Chicago. This past August (2014) marked the 50th anniversary of the martyrdom of Chaney, Goodman and Schwerner. Chaney (African American), Goodman and Schwerner (both Jewish) were lynched for daring to register Black voters in Mississippi in 1964. 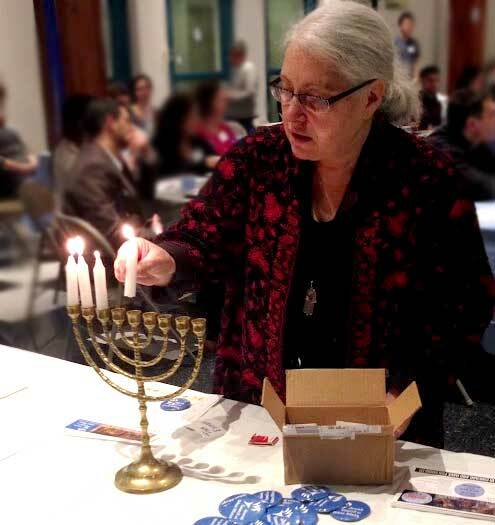 JCUA member Tina Escobar kindles the lights of Hanukkah at the JCUA member party. It is out of this history JCUA was born. For over 50 years JCUA has partnered with diverse communities to carry out the prophetic vision of tzedek, tzedek, tirdof–Justice, Justice, shall you pursue. As my first employer after graduate school, JCUA holds a special place in my heart and professional career. I was and still am drawn to JCUA because of its core values–Justice and Tikkun Olam. 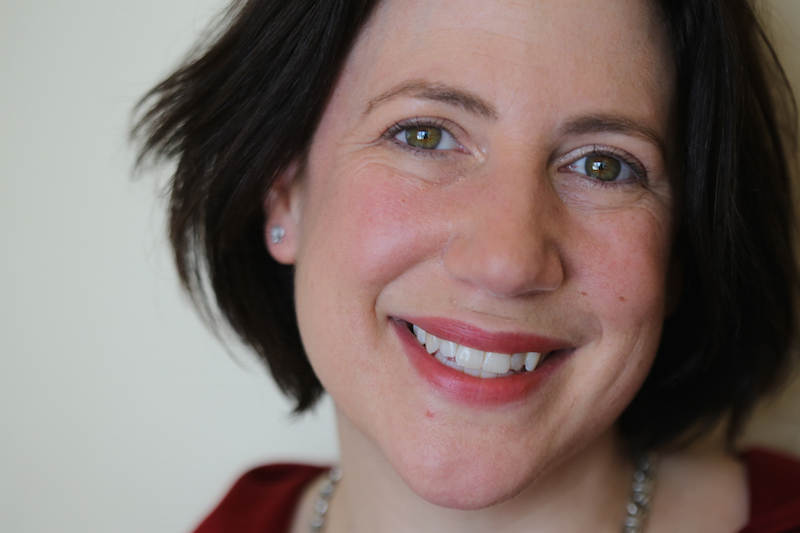 JCUA recognizes that Jews are neither powerful nor powerless, but they can be bridge builders and relate to both the powerful and the powerless. Today, as a member of JCUA, I can be my whole, authentic self: A Jew, Black, multicultural, a woman and a citizen concerned for my fellow man, without being asked to choose only one. As a Jew of color, I realize that I have a dual consciousness and I can be a living bridge between my communities as well as many others. As leaders, we must come together once again and harness the common ground of humanity to shed light on the plagues of darkness that foster racism, anti-Semitism, and all forms of oppression. New prophets may never arise such as Moses, Dr. King, or Rabbi Abraham Joshua Heschel, but Judaism calls on us to be prophetic voices, lights among darkness. Rabbi Schneuer Zalman of Liadi once said, “A little bit of light dispels a lot of darkness.” The Talmud teaches, “We don’t depend on miracles,” we have the opportunities to be lights in the darkness. JCUA is a treasure trove in both Chicago and social justice history that is rare to find. Sometimes I know I can feel paralyzed by what I hear on the news. But as a member of JCUA, I have the opportunity to be a part of solutions. JCUA acts as the shamash (servant candle on our Hanukkiah that lights the other candles). As a JCUA member, I get information about issues and how to process them according to Jewish values. And I also get to lend my voice and experiences. What am I saying? JCUA is looking for a few good members to be lights in this generation. As I look out I see many lights shining tonight. Let’s keep the flames of Justice burning bright long after Hanukkah. Join with me as a member of JCUA; there is room at the table. Let JCUA keep your flame shining brightly. I will see you at our next member meeting. Stacey presented these remarks at the JCUA member Hanukkah party. Our next member meeting is Wednesday, Jan. 21, 2015, location TBD. 8. The way of peace they do not know, and there is no justice in their paths; they have made themselves crooked paths; whoever goes on it knows no peace. Last night, the grand jury in Ferguson, Missouri chose not to indict Darren Wilson, the white police officer who shot and killed Michael Brown, a black unarmed teenager. 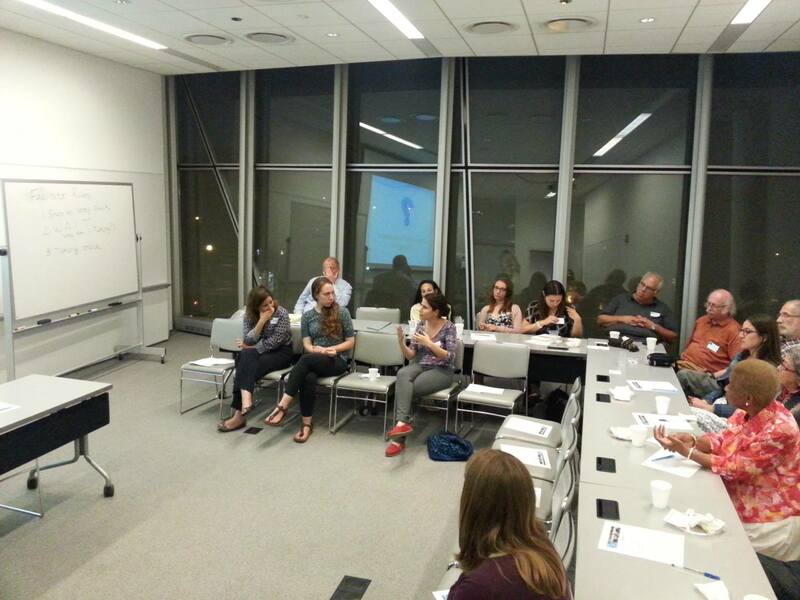 As a Jewish organization dedicated to ending systemic racism in Chicago, we believe it’s important for the Jewish community to pause and reflect on how we must respond. Jewish tradition teaches that humankind is created in the image of God, B’tselem Elohim. From this we learn, quite simply, that all lives matter. As Jews living in the United States, we have an obligation to not only affirm that all lives matter, but specifically black lives matter. 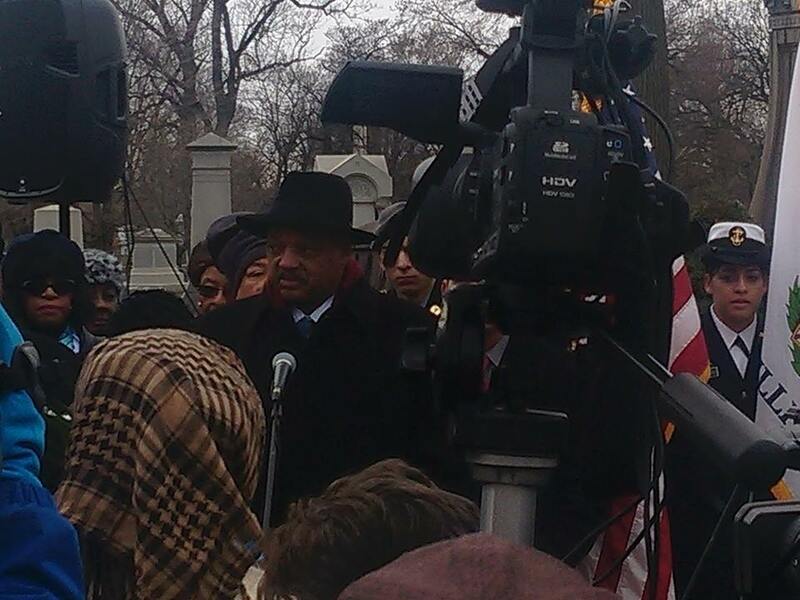 Last night, I joined hundreds of black community members and allies in anticipation of the grand jury decision. Standing outside a police station on 35th and Michigan, I heard youth activists recall the names of countless black men and women whose lives had been prematurely extinguished. In addition to Michael Brown we remembered Roshad McIntosh, who was shot by Chicago police in August under similar circumstances. We remembered Tamir Rice, a twelve year old boy shot by police in Cleveland last weekend. We remembered Marissa Alexander, a victim of domestic violence who will serve three years in prison and have a lifetime felon status because she fired a warning shot away from her attacker. We remembered Trayvon Martin. All black, and all killed, incarcerated, or otherwise failed by predominantly white juries and white law enforcement. While all lives matter, we must specifically uphold black lives because of our society’s systemic devaluation of their worth. Speakers from last night’s demonstration drew connections between last night’s decision to the United States’ history of commodifying black life. From slavery to sharecropping to redlining and exploitative housing contracts to the prison industrial complex, these recent episodes of police brutality fit into a centuries-old legacy. A group called “We Charge Genocide” recently testified to the United Nations Committee Against Torture about police brutality in Chicago and the United States. Last night’s grand jury decision was not a tragic episode, but rather another product of a deeply ingrained system that exploits and dehumanizes black bodies and minds. We must always remember that to pursue justice means to shine a light on structural racism and inequality however and whenever we can. When JCUA sang for a trauma center in September, we did so because we understand that systemic racism in Chicago has deprived entire swaths of the city a fundamental medical service. When we support immigrants seeking sanctuary, we do so because we recognize that economic and political forces pressure people to immigrate whether or not our immigration policy allows them to. When we stand with workers seeking redress for wage theft, we do so because we know our economic policies have created staggering wealth inequality and privileged the profits of corporate executives over the rights of the working class. Everything we do at JCUA is connected to a systemic injustice, and without calling out these systems we cannot pursue justice. Today, let us take a moment to pause from our regular programs and campaigns to reflect on this travesty. As we take a moment to truly feel for Michael Brown, his family, and so many other extinguished black lives, let us recommit to our work with an intention to end to perpetuation of systemic injustices across our city. A little less than a year ago, JCUA embarked on a new initiative of developing a membership program. Membership in JCUA costs nothing because it is about investing your passion, desire and time for a more just and equitable Chicago. It is about standing up and saying like the great individuals throughout Jewish history, “hineni – here I am,” and I am ready to do my part in the work of social justice. Since February, nearly 300 hundred people all over Chicagoland have stood up and said they wanted to be involved and take the next step. A major step occurred this past Monday night as we held our first member meeting. What do we talk about when we talk about social justice? Rabbi Robert Marx, the founder of JCUA, said it clearly that “justice involves going beyond yourself.” To be invested in correcting the ills of society and righting the inequalities that are so pervasive, one needs to see beyond his or her own life and perspective. It is in those experiences where we transcend our own boundaries that we come to know the other and by so doing realize the shared humanity that links us all. One such evening was at the DuSable Museum of African-American History, “Question Bridge: Black Males – Mother to Son: A Frank Discussion and Letters of Love” was a moving, inspiring and transcendent experience. We joined our community partner, Fierce Women of Faith, at the event to hear the stories of anguish, despair, hope and triumph. We listened and let the narratives shared enter our hearts and minds. It was a humbling and profound experience to be a part of that intimate space. In the work of social justice one must “go beyond” their own personal experiences. JCUA is committed to continuing the prophetic work of listening directly to the impacted communities throughout our city and partnering together to bring about transformative change. 46 years ago today, Dr. Martin Luther King Jr. was assassinated in Memphis, Tennessee. In his last years, King focused his work on addressing the intersections between economic inequality, poverty and race. King was in Memphis to support the Memphis Sanitation Strike, a critical first campaign in his larger Poor People’s Campaign. 46 years after Dr. King spoke those words, economic and racial inequality are more strongly connected than ever. As we see in this article, income inequality is growing in our city. Chicago’s staggering economically polarization is concentrated in communities of color, and nearly entirely in neighborhoods where CPS closed more that fifty Chicago Public Schools last year. We cannot stop our work to combat poverty. JCUA is committed to addressing economic inequality in our city and state. That is why we are members of the A Better Illinois coalition. By working with A Better Illinois on changing Illinois’ flat rate income tax system, we are not only advocating for a more fair income tax. We are also advocating for a solution to Illinois’ massive deficit and the resulting cuts in vital programs and services for the economically marginalized. Together, we can stop the growing stratification in Chicago and draw a new map with more just colors. Want to get more involved with JCUA and A Better Illinois? Click here. Harold Washington served as Chicago’s first African-American Mayor from 1983 until his death in 1987. Christopher Huff, JCUA’s community organizing intern, attended the ceremony commemorating 26 years to Mayor Washington’s death, on November 25. In this post, Christopher reflects on the future of Washington’s legacy. 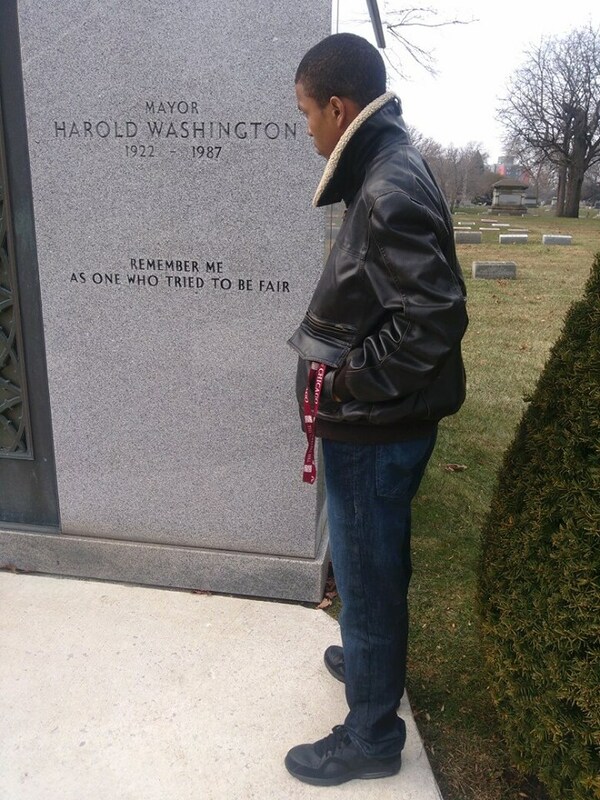 Christopher Huff at Mayor Washington’s grave. Fairness is much more than just a favored position. Fairness is a necessary condition for the existence of a civilized society. Fairness is a guard against injustice and a key component to any act derived from the intent to be free from bias or prejudice. We must never forget this important role that fairness plays in the development of our society. Fairness is one of the most important tools we have to ensure not only the promotion of social justice, but the advancement of economic and political opportunities for those in need. Mayor Washington at a JCUA event in 1983. 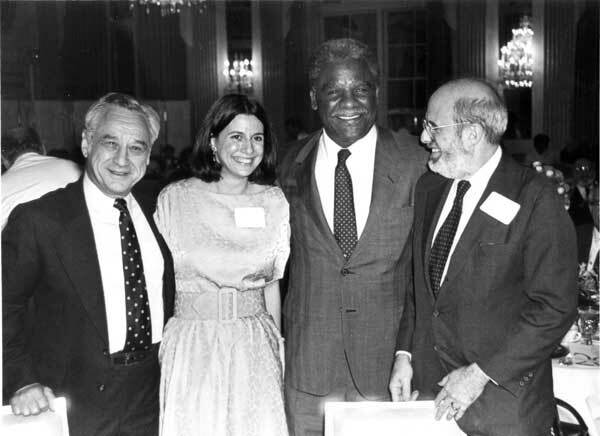 With him (right to left): Rabbi Robert Marx (JCUA founder), Jane Ramsey (JCUA executive director, who later served in Washington’s cabinet), and Kurt Rothschild (then JCUA Board president). Now, we fast forward 30 years following his inauguration and exactly 26 years past his shocking death and there I stood in front of his gravesite as a community organizer in training at the Jewish Council on Urban Affairs and student at the University of Chicago – School of Social Service Administration inspired by his words and dedicated to a call for a more fair Chicago for all the city’s residents. Chicago has a come a long way since the passing of the Harold Washington. It has grown to become home to more than 2.7 million people and the second largest labor force in the United States. It remains the premier location for global conventions, tourists, and immigrants of all types of colors, creeds, and ethnic backgrounds. However, if we are going to truly address the issues of racism, classism, and anti-Semitism that has plagued our city for generations once and for all, we must increase our willingness to work collaboratively across culture and religion – regardless of any fear or caution we might possess. For nearly 50 years, JCUA has worked collaboratively across various cultures and religions to help address issues of race, class, and anti-Semitism. Building on the prophetic Jewish values of “Tzedek” (justice) and “Tikkun Olam,” (repairing the world), JCUA inspires me to continue working toward the creation of a more fair and just Chicago. And now, more than ever, I hope that you also stay committed to the principles of Tzedek and Tikkun Olam as you look to continue or renew your commitment to Jewish life. You are currently browsing the archives for the Black-Jewish Relations category.